The days are getting longer. After what seemed like a full two solid weeks of gray skies, there have been brilliantly blue sunny skies. Even though I start to get seed and plant catalogues after Thanksgiving, I simply pile them on the ottoman and don't really start looking at them until now. It's kind of useless to plan when I haven't the cash to make any purchases. Over the weekend, I sorted through the stack, recycling over 75% of them. It's time to start thinking of what I want this year. 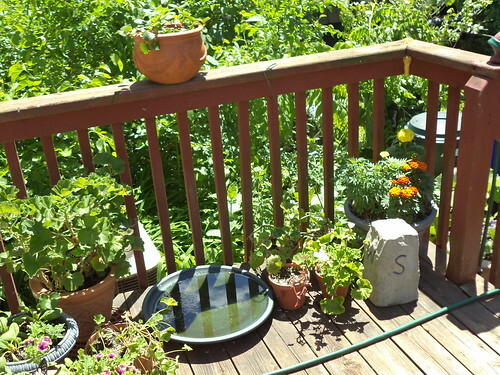 I reconfigured where the flowers were on the deck last year. Usually, this corner is flowers. I had zinnias in a pot to the left, as you're sitting, of the chair. I bought that mesh table because Pilchard likes to sit on the ottoman to the right of the chair where the ground feeder rests. That didn't leave a spot for me to put my book, my tea, my cross-stitch projects. So another table was in order. 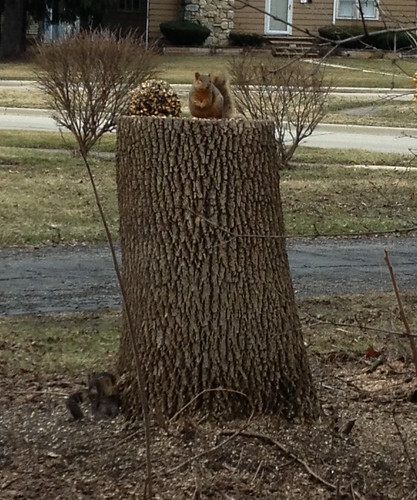 I wanted to sit and watch the squirrels to the left when they feed on the tree stump. Mainly, changing where I sat was a function of sunlight. It's at my right side and back, instead of my left side and front. 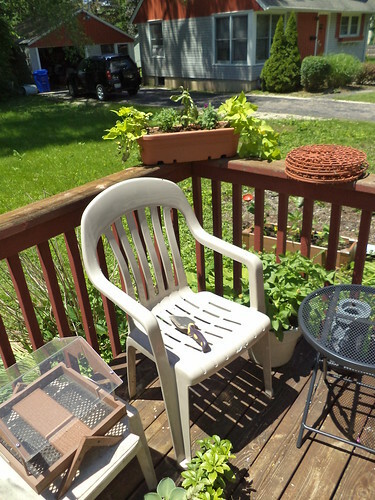 So that left the south side of the deck free for the organization of plants. 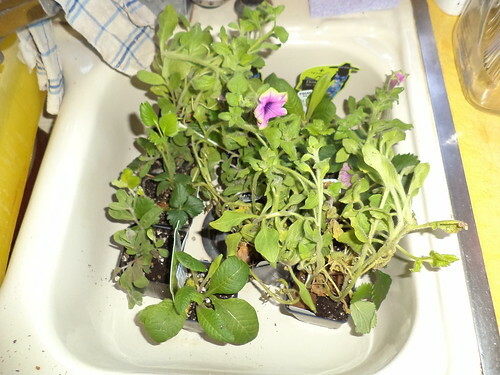 By the time I got the plants outside, due to chilly weather, they'd spent a couple of weeks in a box and in the sink getting watered. They were leggy and a bit awkward. I wound up losing three of them. But that taught me when I order this year, delivery can't be until May 1st. April weather is just too dicey and I need to be able to put these out within a week of arrival. The wave petunias, grown to cascade over the side of a pot, lasted until early September. I have to quit ordering primrose. As pretty as they are, they do not blossom for me and don't do well in pots on my deck. They are akin to pansies in that they don't like hot weather. I don't like the strawberries I ordered last year, but I can't remember what the name of the ones were I ordered the year before. Maybe I should forego strawberries as the squirrels get to them before me. 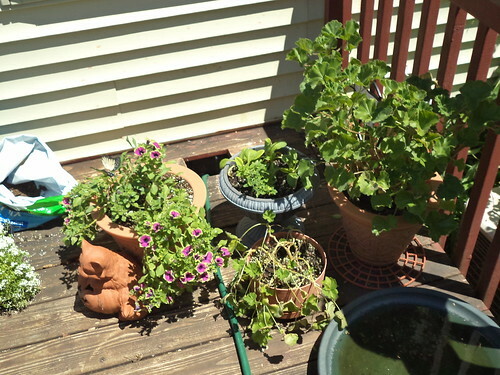 The geraniums were a bit leggy when I put them outside, but a trimming back made them nice and bushy. This was a nice arrangement. The birdbath, however, was not used nearly as much as it had been in previous years. I don't think creatures felt safe. One of the issues is that the gutter is bent to the south of the door and when it rains heavily, water cascades onto the deck and anything below it. 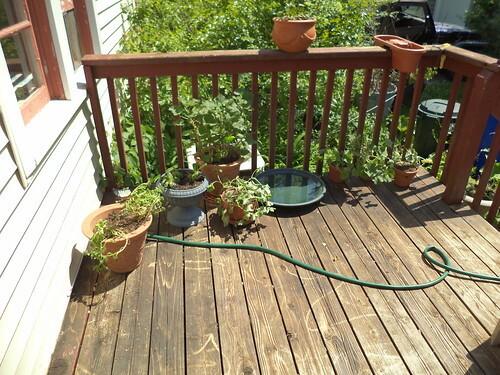 I'd move flowers to that section of the deck, but they would be drenched and probably destroyed by rain. I have a problem, as it is, with squirrels digging in my plants. I think I need to move the birdbath closer to the deck steps this year. I also have to put the pot on the railing up onto something to allow air to circulate under the pot. I don't have enough of those plastic things I use under deck pots. I have had them for years and don't know if I can find anything like that anymore. 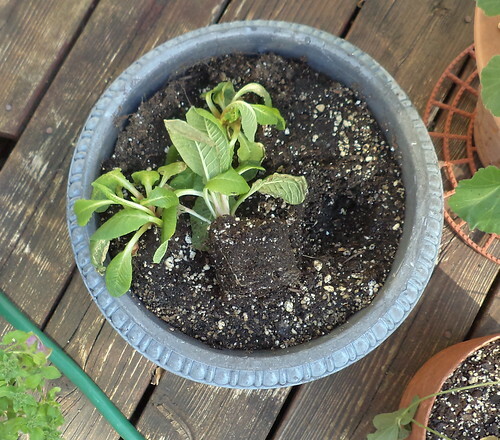 The moonflower, datura, which goes in the pot by the steps, didn't do as well as in the past. 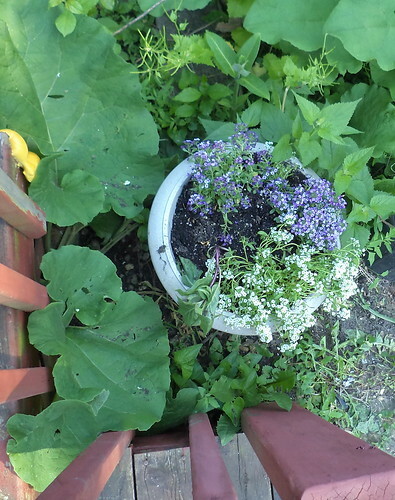 The alyssum did wonderfully, but the moonflower just didn't grow very big. I missed the giant trumpet blossoms and the intoxicating fragrance. The area around this pot has been cleared, but this year, landscape fabric and mulch is going down in this location. It's near the air conditioning unit and that area is going to be cleared so the unit is free of weeds for air circulation. So the temperatures are going to be in the mid to upper 40's this next week. The back yard is a swamp. I'm itching for spring to get here and for flowers and plants to brighten the yard again.